Hens have spent from one to six years of their life -- a long time for a chicken -- roughing it in the chicken coop, making sweet chicken love and laying an egg every day. That's a full life for a chicken, and her meat shows it. Hen meat has a rough texture and toughness that comes with age, nothing like the tender meat of the 6-week-old broilers you find in supermarkets. You have to treat hens as cooks in the 19th century treated chickens, working their meat into submission with braising. 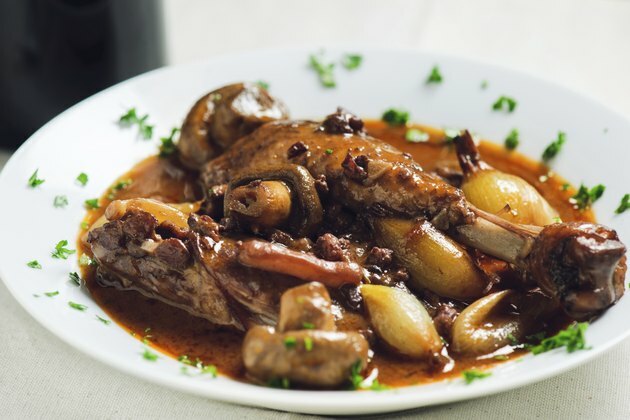 Before commercialization of chicken production, chickens had naturally tough, gamy meat, much like that of the modern hen, necessitating the need for recipes like coq au vin, in which marinating and slow cooking tenderize it. Heat the oven to 275 F. Place the chicken in a large food container or pan. Pour the wine over the chicken and turn the pieces over a few times to coat them. Cover the container with plastic wrap and let it marinate overnight in the refrigerator. Take the chicken from the container and set it aside on a plate. Season the chicken with kosher salt and freshly ground black pepper. Reserve the wine. Add 2 to 3 tablespoons of olive oil to a Dutch oven or similar oven-safe heavy-bottomed pan with a lid. Heat the oil over medium-high heat on the stove. Sear the chicken on both sides until the skin develops a rich golden-brown color. Set the seared chicken pieces aside as needed to make room as needed. Add the onions and garlic to the pan and cook them until caramelized, about 7 minutes. Deglaze the pan with 1/4 cup of brandy or chicken stock. Add the wine, bay leaves, peppercorns, parsley stems and tomato paste to the pan. Next, return the chicken to the pan and add enough chicken stock to just cover it. Sprinkle the flour over everything in the pan. Turn the chicken over a couple times to distribute the flour. Cover the pan and place it in the oven. Braise the chicken for 2 to 4 hours and check its tenderness. Continue braising the chicken until it falls off the bone. If you want to add vegetables to the chicken, such as carrots and new potatoes, add them after 2 hours of cooking and continue cooking until they are tender. If you're cooking a Cornish hen -- which aren't hens but very young chickens -- go with a simple roast in a 350 F oven for 30 minutes. Prep Cornish hens as you would a roaster: brush it with olive oil and season it to taste with kosher salt and freshly ground black pepper.